Are we doing all we can to support those entrepreneurial people in communities who are make genuine, lasting difference? 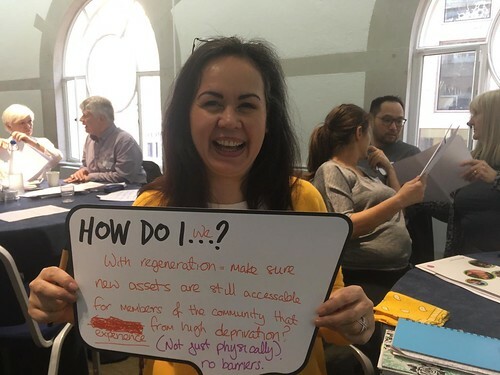 This was one of the questions posed at UnLtd’s Enterprising Communities event, where people from across the UK came together to recognise achievements, share the experiences and forge new relationships. The event was not only a chance to look at the success of UnLtd and Local Trust’s partnership, but posed a number of questions about the future - how can communities become more resilient and sustainable and what can we do to further help those people who drive change for the better? In attendance were representatives from communities from across the country, working in schemes which solve problems, transform spaces, deliver services and change lives. Matt Leach, Chief Executive of Local Trust, said he is impressed by the different ways people choose to solve problems in their areas. The people at the Enterprising Communities event represented a cross section of these entrepreneurial groups and individuals. Whilst the attendees come from a wider range of backgrounds - from a programme building resilient communities in rural Hungary, to an arts centre in Morecambe via a creative use of systems and design-led thinking in Dudley - there were definite common threads running between all of the attendees. One of the day’s final speakers best captured what it was that tied all social entrepreneurs together, regardless of location, community, or problems faced. Erik Howard travelled from Detroit to talk about how he and like-minded colleagues were attempting to tackle some of the social problems associated with living in a complicated city in transition. “While Detroit may feel very different to a lot of you here, there are a lot of things that we have in common - especially when you’re talking about communities,” said Erik. Erik talked about how social entrepreneurs are “filling the gaps” created by an often fractured society. He discussed how communities - whatever the size, location or challenges faced - have a wealth of assets as well as a complex variety of needs and the work of all social entrepreneurs is focused on bringing together those two things - assets and needs. Mark Norbury, Chief Executive of UnLtd, said he was pleased to see so many gifted entrepreneurs sharing their experiences with each other. “Today has reinforced just how much talent there is in communities across the UK,” he said. Erik also explained his group’s approach to assessing the effectiveness of their work. “We measure our success by the frequency and depth of unlikely relationship that are formed by our work,” he told the guests. The Enterprising Communities event adopted that same approach with a series of workshops, allowing people to hear from a range of social entrepreneurs who discussed their project, the challenges faced and how their bold solutions are serving their community. It was a chance to discover and discuss new approaches to problems which may exist in communities. In one room, Stephen Addison talked passionately about how boxing changed his life and how he’s using that passion for the sport to help young people in his community stay out of trouble and realise their dreams. At the same time, a discussion was being led by Iain Chambers and Chris Llewellyn, who are part of the team that launched the UK’s only community pub on a housing estate. Neil Woodbridge and Sunny Saini talked about how their Community Interest Company, Thurrock Lifestyle Solutions, adopted an unusual approach in its work to remove social barriers for disabled people. Often, support for a disabled person has been centred around handouts, which can serve to simply reinforce the misconceived status of that person in society. But Thurrock Lifestyle Solutions sees those same people as ‘experts by experience’ who have plenty to offer themselves. As such, the governance of Thurrock Lifestyle Solutions insists that 100% of its board are people who identify as disabled. The company now owns four residential properties, several vehicles, an office and five locality buildings - supporting over 250 disabled people aged from 16 to 78 to live the lives of their choice. But the company’s work is having other effects - Neil and Sunny used the example of one member of the Thurrock community, who was at one time costing the local authority £4,000 per week. Through the work of Thurrock Community Solutions that person is now costing the taxpayer just £180 per week and crucially, is an active part of the local community. While the Enterprising Communities event was about recognising the achievements of social entrepreneurs in the Big Local areas, it also sought to address future growth and sustainability. It’s possible to grow a business locally to a certain level, but what about the next level and future sustainability? How do we enable these businesses to grow to benefit the community locally but also become a multi-million pound business that has purpose locked in? For Mark Norbury it’s about creating an infrastructure around social businesses and community organisations that just makes it easier - getting the procedures out of the way and allowing people to pursue their talent and build their enterprise. “I think that work around infrastructure and markets is the key for me,” he said. “Part of that will see investment placed in very small chunks in smaller neighbourhoods than is affordable at the moment. We need to figure that out but we need to do alongside investors - we can’t do it in isolation - they have to part of the solution. Lord Andrew Mawson OBE, the Executive Chairman of Well North, and described as one of the “founding fathers of social entrepreneurship” at the Resilient Communities event, spoke to guests about his vast experience in setting up successful businesses which help the community. He believes it’s now more important than ever to give social entrepreneurs the time and support they need to flourish. Matt Leach said the event marked the end of the first phase of a programme which has seen UnLtd and Local Trust engaging with and supporting local entrepreneurs.